I have been wanting to play around with this for a while, but never seem to have a moment when I am not cooking for someone else, testing something for work, or just too busy! In the name of research (of course!) I have been purchasing gourmet licorice and studying the ingredients and ratios for some time. Finally a quiet night and time to play a little! I’m not going to tell you I made this up, I researched the methods quite thoroughly, but liquorice is definitely easier to make with the aid of Thermomix…don’t try this at home without one! Clearly this mixture will be quite sticky, but persist...as it cools it becomes easy to remove from surfaces. I suggest you buy one of my Thermo Non Stick Mats to use with this recipe. It definitely will make things a LOT easier. Don't be tempted to add more flour...and hey, the next trial will involve GF flours, or perhaps we could start looking at allsorts, I have several requests for fondant made in the Thermomix, which could be a great filling between sheets of licorice...or maybe I should try this liquorice in my own ice cream, what about flavored licorice?….the possibilites are endless, just endless! What does it for you…are you an allsorts, a mango/green apple/raspberry or a straight licorice strap lover? Oh…and how do you spell(t) liquorice….licorice? or liquorice? Either way…authentic, with no nasties…’strap' yourself in for the ride! 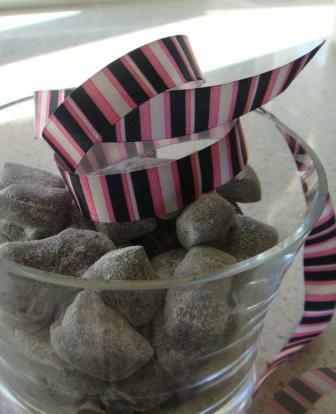 Place around 4-5tbsp liquorice root tea into Thermomix bowl and mill 30 sec/speed 10. (You will not use this whole amount, but it is nearly impossible to mill a smaller amount successfully.) Set aside. Without cleaning bowl, place molasses into Thermomix bowl and cook 30 min/Varoma/speed 2/MC off. Using a small sieve, put 1tsp of milled liquorice root and the aniseed essence into Thermomix bowl and incorporate 4-5 sec/speed 5. Allow to cool slightly. Add flour and colouring if using and mix 1 min/speed 8. Scrape down sides of bowl and repeat. The mix will be extremely sticky. That is OK.
Scrape mixture out onto Silpat mat and cool enough to handle. Cut pieces using a pastry scraper and get rolling...time to revisit your childhood, make snakes until all mixture is used. Leave each piece on the Silpat mat, they will harden as the molasses cools. Dust in cornflour if desired, as I found the mixture relaxes and becomes quite sticky again.